An exciting day in Jacksonville came to an end. In the early session, LSU survived and advanced. That’s about the best way to describe the Tigers’ performance. The storyline in this game was Yale’s inability to score from long range. The Bulldogs finished with a horrendous eight-for-37 from beyond the arc. And four of those makes occurred in the final forty seconds of the game. Yale coach James Jones ackonwledged there were missed opportunities. “We obviously didn’t shoot the ball as well as we’d like to or as well as we have in the past. The energy and effort was there, and you’ve got to tip your hat to LSU for holding onto the lead and knocking down their free throws,” Jones said. 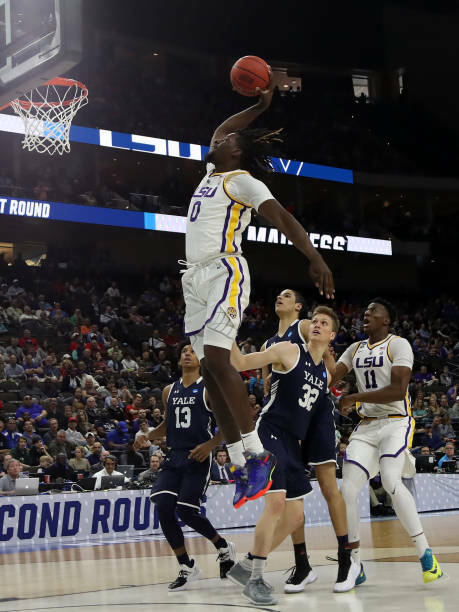 LSU held on for a 79-74 victory. For LSU, there is a noticeable closeness amongst this bunch. Considering all of the speculation on whether the Tigers should have pulled out of the tournament with the ongoing investigations involving suspended Head Coach, Will Wade, the comradery is clear and in abundance. Freshman Javonte Smart, who also found himself temporarily suspended recently, summed up the mood of the team. “LSU is capable of coming together because we are a brotherhood,” Smart said. Maryland’s composure and resiliency was on full display Thursday. Despite trailing by as many as twelve points, Maryland kept battling a tenacious Belmont squad and outlasted them in the final minute. For those who haven’t seen Dylan Windler before, the Belmont senior undeniably rose to the occasion. From a reserve for much of his first two seasons, to a dominating force his final two, it’s a remarkable tale of hard work and persistence. With 35 points and 11 rebounds, this was the type of spotlight performance that will surely elevate his draft status. Windler wasn’t the only one in this game who caught the attention of scouts. Maryland freshman Jalen Smith was equally dominant in the paint. With a combination of toughness and speed, Smith looked the part of an elite NBA prospect. It will be interesting to see Maryland and LSU matchup on Saturday. Can Maryland star Anthony Cowan Jr get back on track after a horrendous shooting night? Can LSU continue stay focused and overcome the distractions that come along with their dysfunctional situation? These questions and more will be answered early Saturday. Kentucky was determined not to be “that team”. They left no doubts against an outmanned Abilene Christian squad. Kentucky will face Wofford on Saturday. The Terriers knocked off the Seton Hall Pirates behind another remarkable performance from senior superstar, Fletcher Magee. From barely recruited out of high school, to now over 2,500 career points, Magee added 24 to sink the Pirates in round one. Magee’s 509 three-point makes is first all-time in NCAA history. He surpassed Oakland’s Travis Bader early in the first half to break the record. With comparisons to Steph Curry, Magee now finds himself a little over 100 points behind his idol in career scoring.